EAST RUTHERFORD, N.J. (AP) — It’s hard to say whether the New York Giants are engaging in wishful thinking or there is something to their optimism these days. The reality is the Giants have a 1-4 record heading into Thursday night’s game against the Super Bowl champion Philadelphia Eagles (2-3) and they are facing long odds in a bid to make the playoffs in coach Pat Shurmur’s first season. The struggling Eagles have beaten New York in their last three meetings and seven of the last eight. The Giants are coming off an excruciating last-second 33-31 loss to Carolina on a 63-yard field goal by Graham Gano, and now they have to rebound with three days of preparation. But the Giants believe there is reason for hope. Their offense scored 30 points for the first time since the end of the 2015 season. The team rallied from an 11-point fourth-quarter deficit to take a lead with just over a minute to play, only to be denied by a near-record kick. And they did all this despite dealing with some ill-chosen words by star receiver Odell Beckham Jr., about Eli Manning and the team’s heart in the days leading up to the game. The Eagles tend to bring out some of the best in the Giants. Despite winning only three games last season, they lost two games to Philadelphia by eight points, with the first coming on a last-second 61-yard field goal by Jake Elliott. The second was 34-29 in a game New York trailed by two points entering the final quarter. The Giants also could be getting some key players back. Linebacker and leading pass rusher Olivier Vernon, who has yet to play because of a high ankle sprain, is very close to ready. Tight end Evan Engram, who missed the last two games with a sprained knee, was going to test his knee in practice on Tuesday. Both were limited. Engram watched the telecast of the game in Charlotte this past weekend and was encouraged. “There was a point in that game where maybe last year or the old DNA of this team would’ve given up or would’ve tapped out,” Engram said. 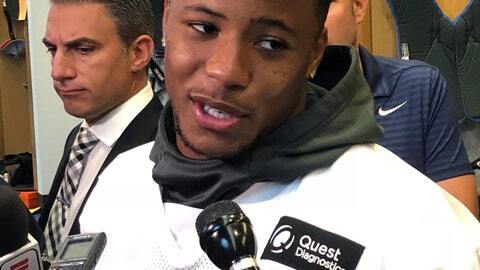 Rookie halfback Saquon Barkley said the Giants scored 30 and left points on the field. NOTES: PK Aldrick Rosas, perfect on field goals and PATs this season, did not practice again because of a sore quad. The Giants have signed Marshall Koehn to their practice squad. He was in training camp. He was working for Randy’s Flooring in Coralville, Iowa when the Giants called Monday. “I looked at my phone because I was making a delivery and there were two calls from my dad, two from my mom and two more my agent. Everyone was freaking out.” Needless to say, he found his way to New Jersey. The Giants can wait until 4 p.m. on game day to active Koehn if needed. … LB Connor Barwin (knee) and WR Russell Shepard (neck) also did not practice. Barwin has been dealing with a knee issue all season.